Photosynthesis is a beautiful game that hides a bit of abstract complexity underneath its pastoral appearance. Though not a heavy game, Photosynthesis can be surprisingly thinky and more than a little cut-throat. It’s a certain kind of game that makes players periodically take out their phones to take pictures of the board for how beautiful it is. 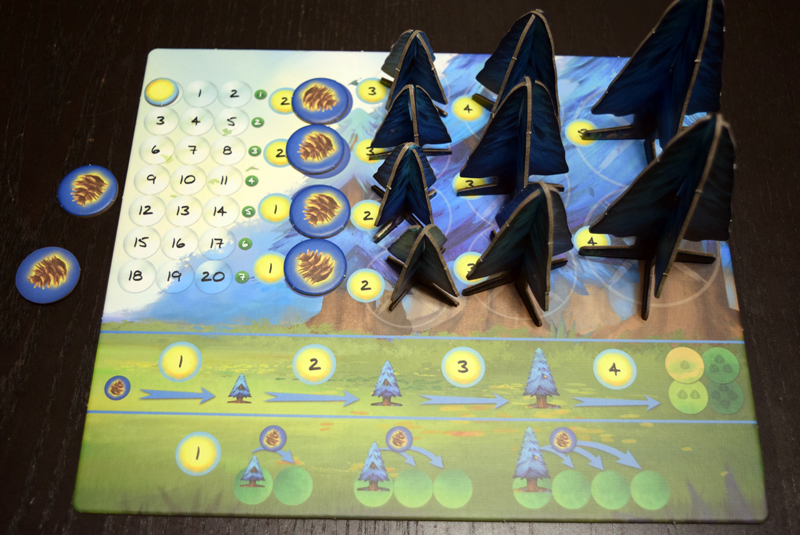 Photosynthesis, from designer Hjalmar Hach and published by Blue Orange Games, is precisely that kind of game. 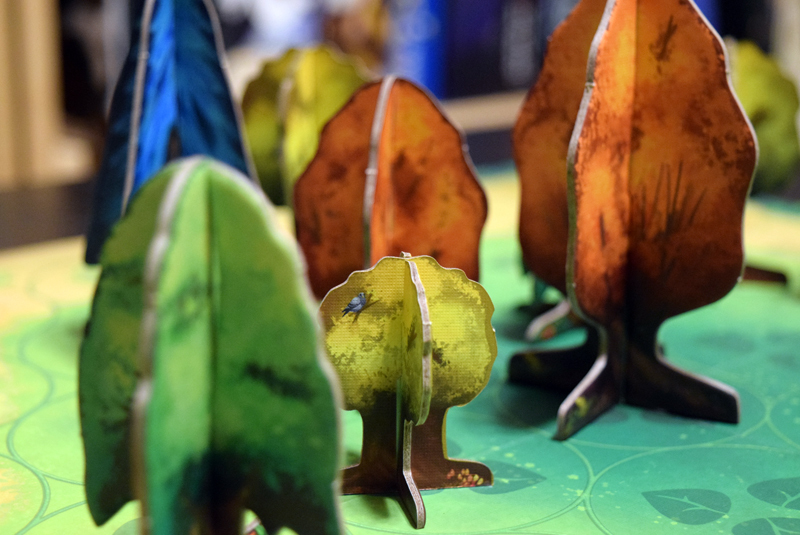 But looks can be deceiving – what may present itself as a beautiful, tranquil game of arboreal splendor is probably more thinky than you might expect. 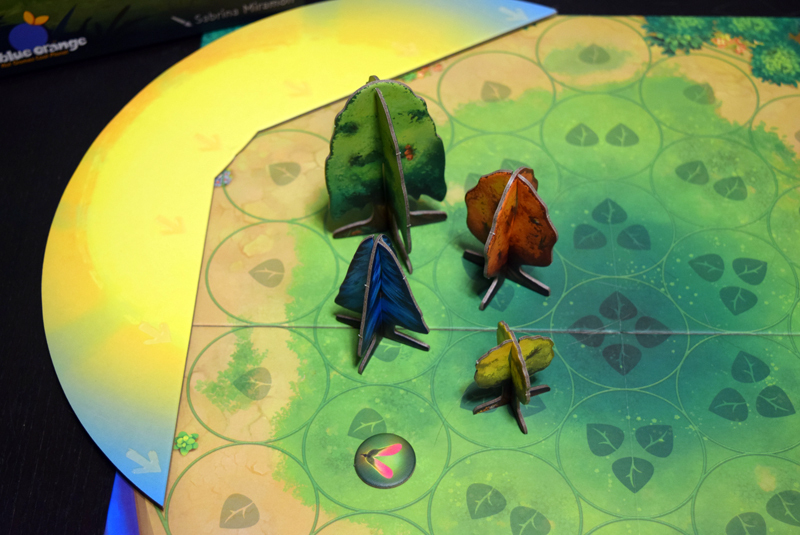 In Photosynthesis, each player controls a different type of tree, all of which compete for the life-giving (and point-scoring) power of the sun’s rays. They will use this power to seed and grow new trees, eventually gaining victory points for taking their trees through their entire life-cycle. Each round of Photosynthesis is divided into two phases, the Photosynthesis Phase and the Life Cycle Phase. During the Photosynthesis phase, the sun will move to a different segment of the board. Any trees which are in a direct line from the sun (and not shaded by other trees) gathers light points for the player who controls it. A tree is considered to be in shadow, and therefor will not gain light points, if there is another tree between it and the sun, with the exception of the fact that trees cannot be shadowed by trees shorter than themselves. 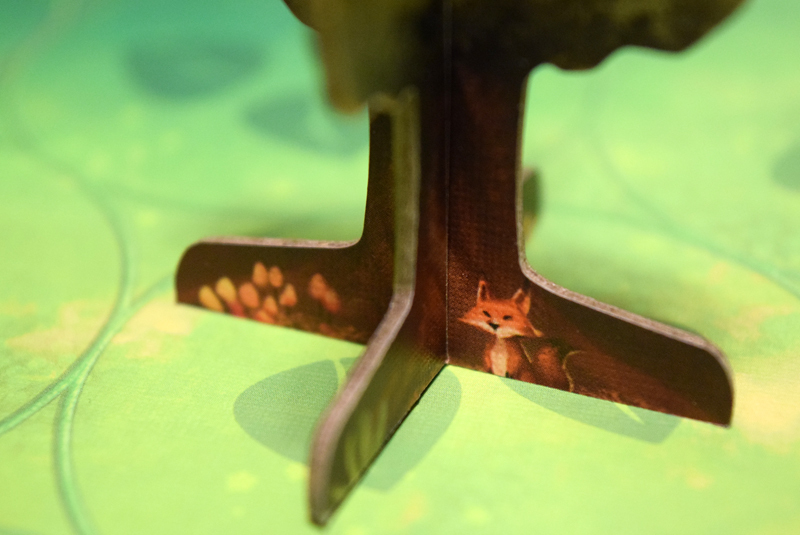 Logically, taller trees also cast longer shadows, blocking more of the forest in addition to gathering more light points themselves, so strategic tree growth is the name of the game. Which brings us neatly to the second phase, the Life Cycle phase. 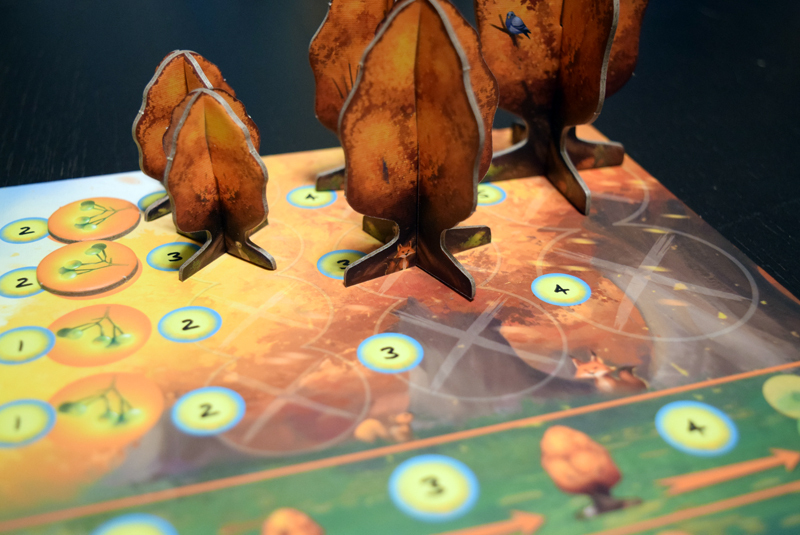 In it, players will take turns spending their light points to seed new trees around the board, as well as grow those seeds into new trees. Strategically positioning yourself around the board is critical for ensuring a steady supply of light points as well as cutting off your opponents from that precious resource, and ultimately as a method of scoring. That’s not Pac Man in the upper-left corner – that’s the sun, source of all your action points. And, you know, life, or whatever. Once a tree has grown to the third, mightiest size, the whole ‘circle of life’ process can be enacted, clearing the space it once occupied. The boon of doing so is that you will score a number of points, based on the richness of the soil the tree occupied (with richer, more valuable plots at the heart of the forest. This act also leaves the space the tree occupied empty, giving new trees the opportunity to sprout here. Each time an ancient tree passes, you score points. Andrew: What’s interesting about Photosynthesis is how it can feel tactical (and more than a little cut-throat) while not having any direct player interaction whatsoever. Jess: Oh yeah, big time. Planning for the movement of the sun and strategically growing trees to block out your opponents (while you get a pile of light points for yourself) requires a bit of forethought. Andrew: Which is fine, of course, but it just wasn’t what I was expecting, either out of Photosynthesis or out of Blue Orange Games, which tends to specialize in very accessible, family-friendly titles. Photosynthesis isn’t complicated – your decisions are fairly limited – but planning ahead and being strategic can have a big impact on your (and your opponents’) score. 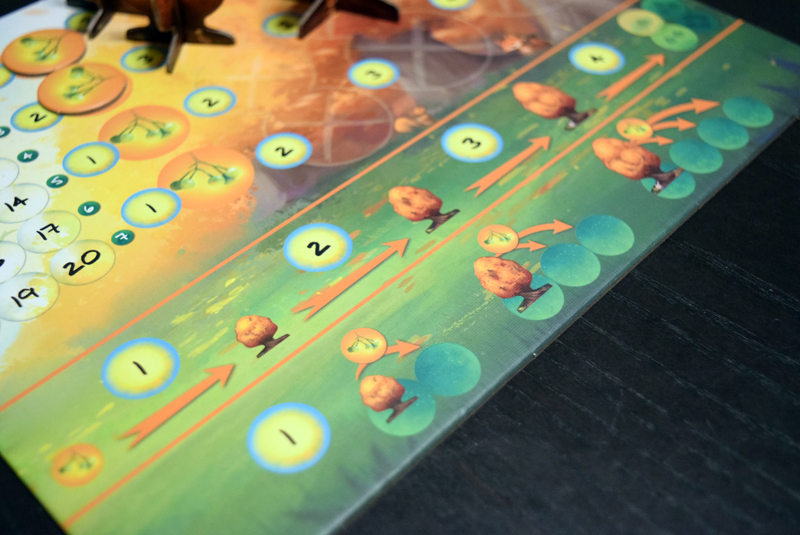 Photosynthesis ends when the sun completes its third rotation around the board (or fourth, in one of the game’s ‘advanced’ variants). 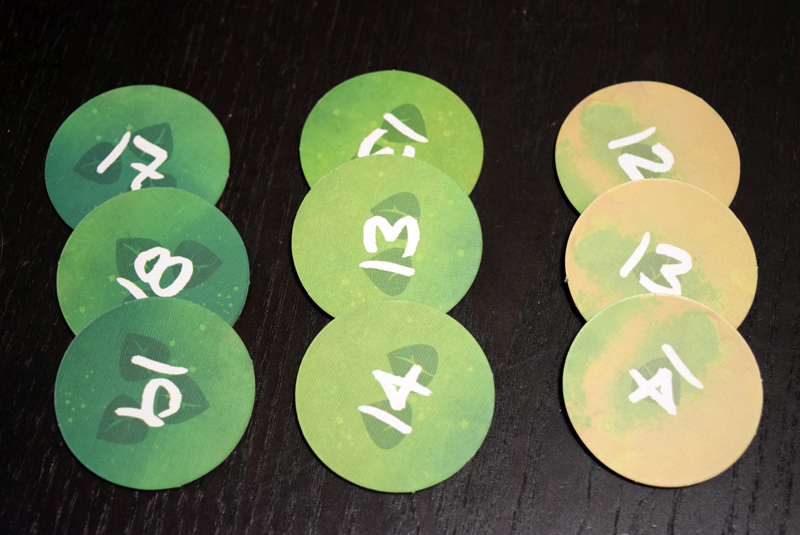 Once that is done, players will add up the point tokens they drew from completing the life cycle of their trees, get some bonus points for left-over light points, and a winner is declared. Andrew: Ultimately, I thought Photosynthesis was pretty and polished and smartly designed, but I’m not sure if I actually had fun with it. Its gameplay did hit a sweet spot between having a limited number of per-turn options and a very concentrated goal, so I appreciated that. But I also felt like it was a tight game, possibly too tight, where I didn’t get to make nearly as many plays as I wanted. Jess: I know! 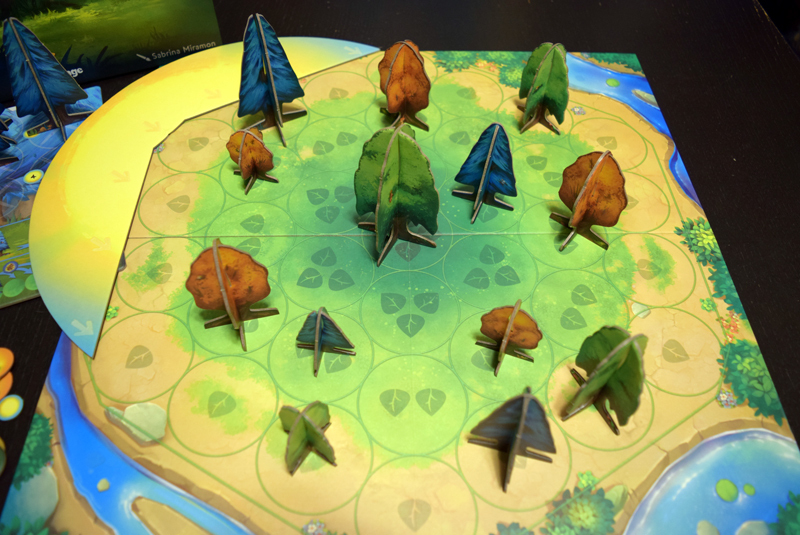 I had these grand designs of creating this sweeping forest, but the fact was that you have deceptively few actions at your disposal, and if the other players are being aggressive and effectively blocking you off from the sun, then you’ll lose turns to a lack of light points, making it even tougher to score more than a handful of trees before the endgame. Andrew: Exactly. Another thing that I found a little odd was the whole need to pre-purchase trees and seeds. Each player’s board is a reserve of these items, and you cannot plant seeds or grow trees until you have bought them off the player board. 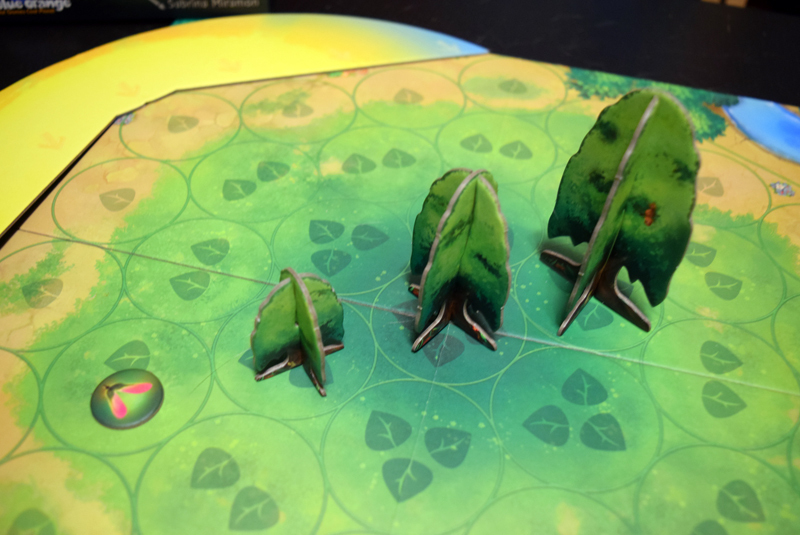 Once they are replaced (because a seed is becoming a tree or a tree is upgrading), the replaced piece goes back to your player board, where you will need to re-purchase them before they can be deployed back to the forest. Andrew: Aside from the slight feeling of double-paying for these resources (buy the tree first, then also pay to upgrade a tree), it was also a little frustrating to permanently lose them – if you, for example, upgrade a small tree into a medium tree, and there is no empty ‘small tree’ space on your board to which to return the one you are removing from the forest, then that tree is simply tossed from the game, never to return. Jess: I know what you mean. I worked really hard to make sure I didn’t permanently lose trees, both because it felt punitive somehow and because even trees of the same size got more expensive the fewer of them there were on the player board, so losing a few early meant needing to spend even more light over time. And yet, all that didn’t really add to the strategy much, it only added bookkeeping and slowed down the game for me, giving me even less light points with which to, you know, actually grow trees and score points. Andrew: That’s at the heart of my criticism of Photosynthesis, actually. Overall, it felt like the game didn’t quite give us the room we wanted to engage its beautiful components and neat central concept. I’m not saying that Photosynthesis is a bad game – far from it, in fact. But I also found there was an aesthetic/mechanic mismatch that took me off-guard on my first play and didn’t add much on subsequent playthroughs. Giant forest monster not included. Jess: For me, it really was the issue of not feeling like I got to do enough. I wanted to grow lots of trees and score lots of points, but it simply wasn’t easy to do so. And while a thinky abstract is just fine, it’s important to know what you’re jumping into. 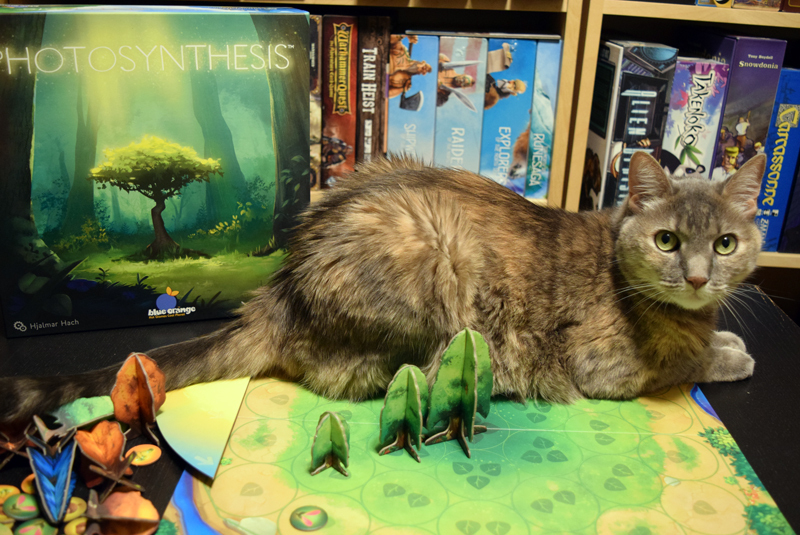 While Photosynthesis wasn’t precisely what we expected, it’s still a good game. It walks that fine line of complexity where per-turn decisions are important, as is overall strategy, accomplishing both without presenting a plethora of options to consider. Our criticisms aside, it is a beautiful, polished game that will be a satisfying experience for folks who will enjoy its more tactical nature. For others, though, it’s no walk in the park. Next Post:Nine All-new Star Realms Sets on Kickstarter Now!